Just learned that Mr. Frederik Pohl died earlier this week. The New York Times did a nice write up. Mr. Pohl was one of those writers I had always hoped I’d be lucky enough to meet some day. But time ran out, I guess. I think I liked his Space Merchants best, but it’s been a long time since I plundered the shelves of my local library in my youth, and as an adult, I mostly liked him because he was a self-made science man. He read and dreamed and wrote about science because he liked it. That’s why he once said he never did any research. He loved what he did, and he did what he loved. My favourite quote from him is this: A good science fiction story should be able to predict not the automobile but the traffic jam. I hope one day that I can produce at least one truly great traffic jam. Rest in peace, Mr. Pohl. What other books of his have you read? It’s been a while, I’m not sure, but I might have picked up Gateway at some point. I know I have had an idea that involves a black hole since I was a kid, and I vaguely remember being inspired by that. But I mostly had great admiration for the fiction he helped produce as an editor and co-writer. People I absolutely adore, such as Asimov, partially owe their emergence onto the scifi scene to him. For that alone, I think he should be appreciated. He gave us more than his stories–he gave us the amazing stories of others. Ah, no fan of Asimov (it’s a long story)…. 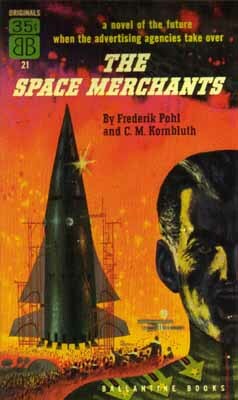 I recommend Pohl’s collaborations (satires) with C. M. Kornbluth (who might have been the better writer — although he died at 34) — The Space Merchants, Wolfbane, etc.